If ever there was a company which encapsulated English eccentricity, it was Marcos. The name was an amalgam of the two founders - Jem Marsh and Frank Costin. Their opening salvo was a wooden sports-car! So successful was it at the track, that Jackie Stewart launched his career in one. Now we know where Stewart first got a heads up for racing 'health and safety'! Out of that ornate oddity emerged the classic Marcos sports car. It was to sport several changes of shape over the years. The formative lines were drawn by Dennis and Peter Adams. Unveiled in '64, the Marcos wowed London's 'Earls Court Racing Car Show'. Its body was fashioned from cutting edge glass-fibre. Its chassis, though, was still made out of wood! Suspension-wise, the Marcos was first fitted with Triumph wishbones at the front, and de Dion and Triumph arms at the rear. That was later replaced by a Ford live-axle set-up. Over time, Ford, Volvo and Triumph motors would be installed. It was already apparent that Marcos did not do 'predictable'! Marcos have long been associated with motor racing. In '66, a 'Mini-Marcos' hybrid was the sole British entry to complete that year's Le Mans 24-hour race. 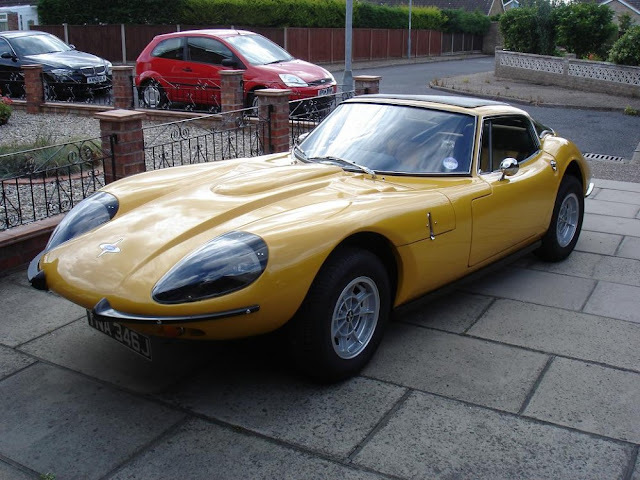 Equipped with a Mini motor, the Marcos was relatively cheap to campaign. It could still be sourced new right up to '94. Marcos' Le Mans exploits were referenced by the LM500 and LM600 models. Launched in '94, they marked Marcos' return to the legendary French circuit. At the start of the '70s, Marcos released the iconic Mantis. As the decade wore on, though, the marque was less visible. It fell to Jem Marsh to keep the servicing and parts departments open. '81 saw a Marcos resurgence - with power supplied by Ford. It was perfect timing. With not a lot happening on the sports-car scene at the time, Marcos' revival was a shot in the arm not only for the marque, but the industry. 1983's Marcos Mantula - complete with a Rover V8 motor - was a hit in the showrooms. More plaudits followed two years later - with the arrival of the Spyder. Marcos moved into the '90s with the Mantara - which saw a shift in styling. The Adams brothers' original curves were still there - but suitably revised for the run-up to the new millennium. '97 saw an update of the mythical Marcos Mantis. Thanks to its Ford V8 engine, the Mantis GT thundered around race-tracks at a top speed of more than 170mph. All in all, then, Marcos had definitely ticked the 'quirkiness' box! But those in the automotive know have never taken the marque less than seriously. Certainly, Marcos cars have raised many an eyebrow, over the years. But one cannot help but suspect that that was always part of the Marsh/Costin game-plan!